Our brain determines our reactions to whatever we come to deal with throughout the day. The levels of mental energy may fluctuate in 24 hours depending upon circadian rhythms. Mental energy and sleep are primarily affected by pain, water intake, and oxygen supply. Furthermore, the food that we eat also impacts our sleep. The human brain requires a lot of energy and nutrients that influence the levels of neurotransmitters, which send out nerve impulses from one (nerve) cell to another. They affect our sleep pattern, moods, and thought process. Excess or lack of certain micronutrients may result in nerve damage in the brain. These are water-soluble compounds, which not only perform metabolic functions, but also enable the body to obtain energy from foods. Particularly, the deficiency of niacin (vitamin B3) causes symptoms like loss of memory, irritability, emotional instability, headache, and sleeplessness. The top sources of vitamin B3 are avocado, peanuts (roasted in oil), sunflower seeds, fresh green peas, mushrooms (grilled portobello), tuna fish (cooked yellowfin), cooked lamb liver, beef (cooked lean rib), turkey and chicken (cooked), and pork (cooked lean). Various studies have confirmed that the deficiency of vitamin C can result in non-restorative sleep. People experience sleep disturbances due to the low vitamin C blood levels. Sleep deprivation may lead to impaired memory. Some of the sources of vitamin C are kale, bell peppers, broccoli, strawberries, and pineapple. Magnesium deficiency is one of the most common problems, since our diet lacks magnesium. For instance, dairy products, meat, and wheat flour do not provide magnesium. Also, excessive intake of salt, coffee, colas, and alcohol decrease magnesium levels. Beans, nuts, greens and sea vegetables on the other hand, are good sources of magnesium. Selenium supplementation is usually provided to people with sleep issues. It can also be sourced naturally from fishes like tuna, halibut, cod, and shellfish or nuts, barley, and turkey. Zinc has antioxidant properties, which ensures the activity of various enzymes in the body. These enzymes are crucial for biochemical reactions. Consumption of zinc helps you deal with the primary stages of insomnia. Meat and shellfish are good sources of zinc. Dietary components influence mental health and overall energy. The functioning of nerves depends upon nutrient intake and the energy we gain from it. The internal process of the brain could be significantly altered by what our daily diet constitutes. Glucose is most commonly cited for proper brain function and hence given more importance. Sadly, micronutrients are quite underrated for the role they play. 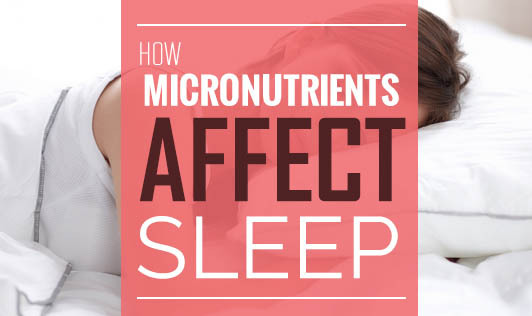 Though there are various studies being done to prove their link to sleep and brain function, the relationship between micronutrients and the CNS (central nervous system) requires more detailed study in the future.